Alice looked at Nellie and Bekka, her eyes wide. "What about me?" Piper asked, as she walked over to the girls. The three girls looked at each other. Nellie stammered, "You're not in our group." "What?" Piper whispered, as she looked at the science fair group list. Tears filled her eyes as she realised that it was even worse than that. Not only was she without her friends, but she was with Tammy and Cindy! 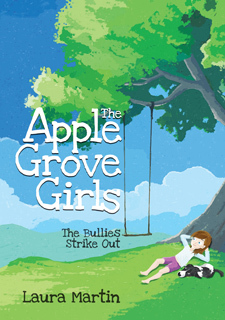 The Apple Grove Girls are a group of four friends who have known each other forever. They have shared in each other's joys and fun and, since the passing of Piper's dad, in their grief too. But this year, the girls' friendship is taken to a whole new level. Nellie, Bekka and Alice don't know what to do as they watch Piper being bullied. They wrestle with hard questions about prayer and God's will. Meanwhile, Piper wonders if God really even does care for her? After all, it was He who took her daddy. The Apple Grove Girls is a sweet story about friendship, trials, prayer and faith. Come and join Piper, Alice, Bekka and Nellie, as their friendship and faith are stretched like never before! Laura is married to Bryan, pastor at River City Bible Church, in Hamilton, New Zealand. They have also served in pastoral ministry in the United Kingdom. They have five children, a crazy spaniel called Milo, and a very naughty cat called Mr Bingley. Laura writes books to encourage women and children in their walk with the Lord and love for His Word. Copyright © 2016 Castle Publishing Ltd.